Nuclear is the only large-scale supplier of 24/7 energy that takes full responsibility for all of its waste and incorporates it into the cost of the electricity generated. To provide an idea of the space required for long-term storage of spent nuclear fuel, all of the nuclear waste generated over a 50 year period by the USA’s one hundred or so reactors, would fit onto one football field piled about 10 metres high. Or put another way: the total waste from a lifetime of energy used by one person would be about the size of a soft-ball. 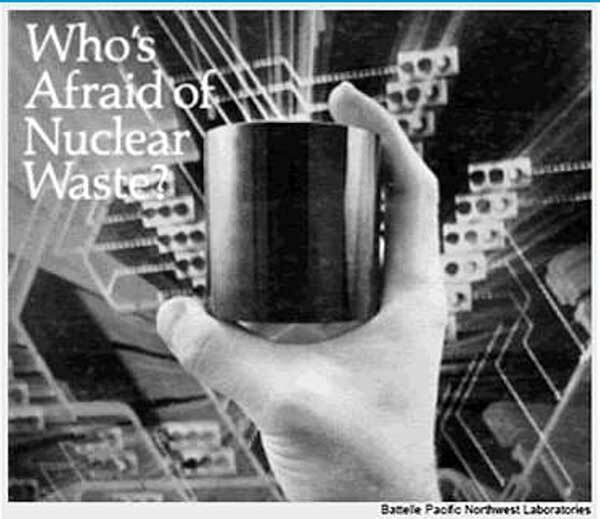 A glass cylinder illustrating the total amount of radioactive waste generated for one person if his lifetime electricity needs were supplied by nuclear energy. About one third of the fuel is usually removed from a reactor at a time, and is replaced with new fuel rods. Spent fuel is highly radioactive and it is hot when it is removed from the reactor core. It is submersed in a pool of water within the reactor complex for at least a year. Not only do the short-term storage ponds allow the used fuel to cool, but the water constitutes a very effective barrier to radiation emanating from the used fuel. US Federal Regulations recognize that spent fuel can be safely stored in these ponds for at least 30 years (Title 10, Part 51.23(a); http://www.ans.org/pi/ps/docs/ps76-bi.pdf). Long-term storage needs to ensure that radiation does not emanate from the spent fuel as well as ensuring that the waste material cannot be corroded or otherwise eroded to contaminate the environment. Many facilities in Canada, Europe and the USA use dry storage after the fuel has been cooled in short-term storage ponds. In Canada, dry storage containers are made from reinforced high-density concrete about 50 centimetres thick that is an effective barrier to radiation. The concrete is lined, inside and out, with a half-inch steel plate that protects the concrete from the environment (https://www.nwmo.ca/en/Canadas-Plan/Canadas-Used-Nuclear-Fuel/How-Is-It-Stored-Today). In Europe and the USA the spent fuel from the cooling ponds is loaded into steel canisters from which water and air are purged, and the containers are filled with inert gas before being permanently welded shut. The canisters are then placed in a steel and concrete cask that is sealed. The casks are designed so that they absorb the radiation generated by the spent fuel (http://www.nrc.gov/reading-rm/doc-collections/fact-sheets/dry-cask-storage.html). The US Nuclear Regulatory Commission has determined that nuclear waste may be safely stored in dry casks for at least a century (http://www.ans.org/pi/ps/docs/ps76-bi.pdf). Another method of long-term storage of high-level radioactive waste involves its fusion into glass that is chemically stable and that does not degrade, corrode or erode. In the USA, the vitrification plant that fused high-level radioactive waste into borosilicate glass has been in operation for 20 years at the Savannah River site. The Australian Nuclear Science and Technology Organization (ANSTO) has been working on a method of used nuclear fuel storage that it claims will reduce the volume of nuclear by-products by 99%. The “Synrock” technology produces a ceramic that is made from a mixture of natural minerals that incorporate the elements present in high-level radioactive waste into their crystal structure – these elements then form an integral part of the ceramic and therefore can’t be eroded or oxidized and released into the environment. The first step in the process is the mixing of radioactive waste in a liquid with additives. This initiates the process in which the radioactive material is incorporated into the molecular structure of the additive minerals. The mixture is then dried to form a powder that is poured into a metal vessel that is sealed. The powder is compressed at sufficiently high pressure and temperature so that the granules containing the radioactive isotopes become fused into a solid ceramic mass encapsulated by the metal vessel. These vessels contain any radioactivity that is generated by the spent fuel and would be housed in a long-term storage facility. Finland’s Onkalo spent nuclear fuel repository is under construction in ancient granite bedrock near the west coast of Finland. The access tunnel will spiral down to a final depth of 520 metres (1,400 feet). Chambers will then be excavated for the storage of all of the spent fuel from Finland’s reactors. The spent fuel will be encapsulated in boron steel canisters that are further encapsulated in copper, and each capsule will be housed in its own excavated cell with bentonite clay packed into the cavity between the cell walls and the canister. The cost of construction of the long-term storage facility is about C$ 1 billion. The facility will have capacity for about 100 years’ worth of spent nuclear fuel, and when it reaches capacity, the access ramp will be backfilled and sealed. Canada is taking a similar approach with a number of potential sites under investigation for the excavation of an underground storage facility in the granitic rocks of the vast and ancient Canadian Shield. The USA was taking a slightly different approach to the underground, long-term storage of its spent fuel. The Yucca Mountain location was initially identified as a suitable long-term disposal site, and differs from the Onkalo and Canadian sites in that it lies in layered volcanic rocks, as opposed to granite. However, federal funding for the site was suspended in 2012 for political rather than technical or safety reasons. The long-term storage facility for US government agencies is located in New Mexico where spent fuel is stored in galleries 660 metres (1,150 feet) below surface. Mexico’s long-term used nuclear fuel storage facility at the Laguna Verde power plant site is nearing completion after a construction period of only 16 months. Holtec will start loading dry fuel storage cells into the facility in July 2016, and loading is scheduled to be completed by the end of 2016 (http://www.world-nuclear-news.org/WR-Mexican-dry-storage-facility-nearing-completion-2406167.html).